My first ever visit to the Isle of Man. An enjoyable four day break, mainly spent walking along the coast footpath and from Douglas to Peel along the old railway, but with the opportunity of both some photographs of and a couple of rides on the Isle of Man Steam Railway. No chance of riding the Snaefell Railway unfortunately, as the bad weather of mid-March meant the summit remains closed and the season won't now start until May 1st. We saw the Manx Electric but any pictures of that unique line will have to wait for a subsequent visit. 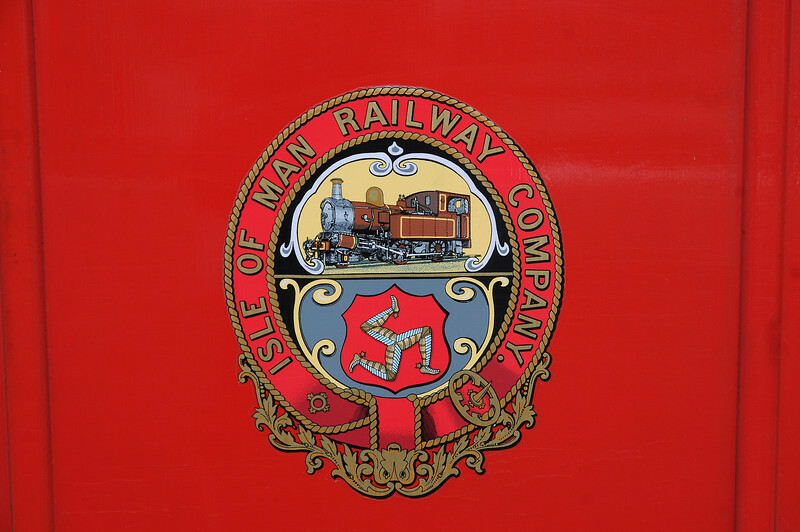 The crest of the Isle of Man Railway with the three legged symbol of the island - Tree Cassyn Vannin in Manx Gaelic - and a Beyer Peacock 2-4-0T. The latter is something of an island symbol too as it formed the principal engine type. In fact there was only one locomotive that wasn't a 2-4-0T and wasn't built by BP, Manx Northern 0-6-0T Caledonia from Dubs.